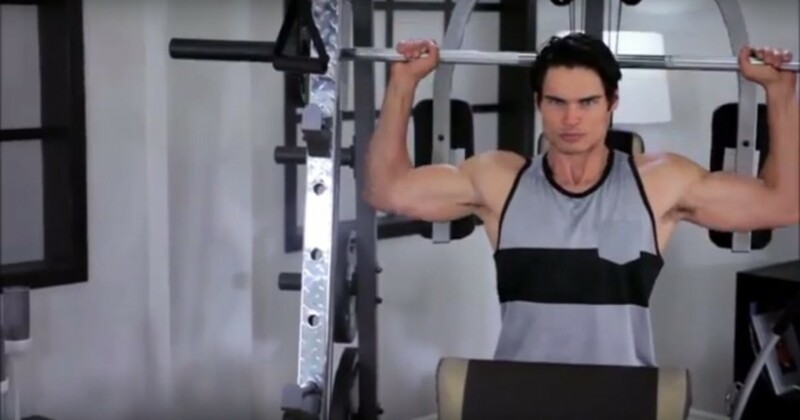 Is The Marcy Diamond Elite MD-9010G The Most Complete Smith Machine? Weight training can benefit absolutely anyone, it's not just for bodybuilders and that also goes for the best home gym's for strength training. For many years cardiovascular machines have taken the main stage when it comes to getting fit and healthy. However, recent studies have shown that you can get more comprehensive results in health, fitness and weight loss through resistance training. Using a combination of the two is even better. Many people see gyms and leisure clubs as a barrier to participating in exercise, the recent revolution in technology of home gyms has lifted this barrier and given people the chance to get commercial grade fitness equipment at home without having to worry about making time to drive through traffic and park up to go to the gym, where it may be busy and you may not be able to get on the machines you want. Home gyms now offer every bit of equipment you will ever need, generally in a fairly compact and great value for money machine. Why is the Marcy Diamond Elite MD-9010G Smith Cage A Must-Have? Marcy the company was formed by the legendary Dr. Walter Marcyan who died in 2007 aged 94. Walter was a strongman and lifting competitor and known for performing incredible feats of strength, balancing acts. He spent his life educating people about the benefits of strength training for men, women and children. From his knowledge and experience he set out to create high performance fitness equipment, believing that everyone should have the capability to workout properly at home. Walter’s designs set industry standards and were ground breaking at the time and most designs today are based on his concepts. Versatility: its comprehensive exercise features are virtually unparalleled in the home gym market. 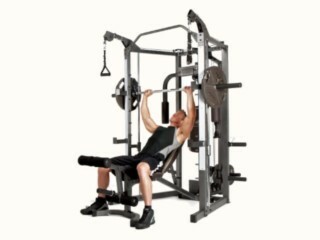 The machine gives you the ability to train over 100 efficient exercises in one compact design, it comes with a solid squat cage, pec fly, leg developer and cable pulley system. Strength and functional training combination: the ability to be able to use a smith machine bar as well as a free olympic bar is hugely overrated. Free bar exercises such as squats allow you to activate more muscles and train the additional muscles in maximal capacity, reducing the risk of injury whilst increasing performance. The dual pulley cable system also allows you to train more functionally through greater range of motion. The height is 95”, width 79” and depth is 86”. The depth includes the adjustable bench which can be transported easily. The height is 95” including the Olympic bar stored vertically. Does it come with an Olympic bar? No, you need to purchase this separately which i strongly recommend doing. The machine does come with a fixed bar. Are the weight plates included? The weight plates for the bar and storage pins are sold separately and fit 2” Olympic size plates, these are very common. Is the fixed bar safe? The fixed bar comes with rotating handles which can be hooked onto safety locks at any point of the lift. For the free bar the machine is fitted with adjustable safety hooks to adjust to your required height or depth. Whilst performing a bench press for instance set the stoppers a few inched above your chest, this will allow you to be able to get out from under the bar if you fail to lift. Does the machine move when you lift heavy? It may not be as stable as some very heavy duty commercial use machines but it is made of high quality parts and bearings. You will be able to use this machine with heavy weight no problem. Can the bench be adjusted for an incline and decline? The adjustable bench is very easy to use, the pop in system can be pulled by people of any strength. It offers various angles such as a full incline and decline. Does this machine have a leg press? No, although the squat rack and leg developer should cover your needs nicely. You could also use the fixed bar as a vertical leg press if you lay on your back. What is the maximum amount of weight you can lift with this machine? The weight capacity for this home gym is 300lbs. Is it difficult to assemble? It can be assembled by yourself but having someone else available will help. You will need to know how to use basic tools and follow a user manual with simple diagrams. Total time may take 2-3 hours. If you are short on time you can also purchase an assembly package and someone will turn up to your house to put it all together. Is there a low pulley? Yes, there is a low pulley with an ankle strap for glute work. You will also be able to perform kneeling exercises such as bicep curls. 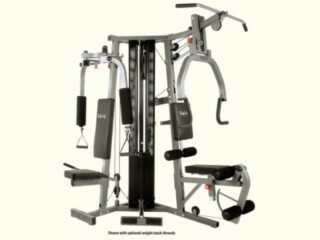 How Can I Use This Marcy Diamond Elite MD-9010G Smith Machine To Build Muscle? Can You Perform Pull-Ups On This Machine? No there is not a pull up bar, I would suggest the lat pull down as an alternative or buy a separate bar that attaches to a door frame. 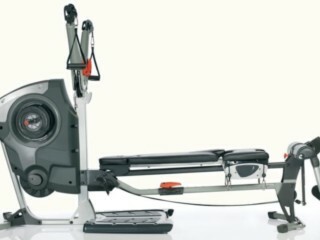 Can You Perform Leg Curls On This Machine? Yes you can perform these in the seated and lying positions, different variety in angles is essential to develop strong, flexible hamstrings. Will The 4 Legs That Are In Contact With The Floor Damage The Floor? It may be worth buying some foam mats if your worried about imprinting the carpet or damaging floors. Its a heavy machine so make sure you’ve put it on a solid floor, the garage would be best. The warranty covers 2 years on parts with a option to extend to 5 for a price. Video of Marcy Diamond Elite Smith machine with many modifications. So What’s My Verdict On The Marcy Diamond Elite MD-9010G? This machine is extremely versatile and will cater for all of your weight training program needs, its variety in exercises is almost unparalleled in its price range. This product could be made better by the addition of a pull up bar and a leg press machine, but it does offer a comprehensive number of exercises to train the back and legs. The combination of machine, free weights and a cable machine will help your body get an efficient and functional workout, similar to what you would get in a commercial gym. The solid frame and basic parts allow for simple maintenance and care, the bench and pads are high quality and wont rip easily as long as your wearing appropriate gym wear. The added accessories for the cables are a good bonus but I strongly recommend purchasing a solid olympic bar and weight plates, along with collars. You will be able to store all of these extras neatly and safely on the machine. If you can't get to the gym and want to weight train at home, you wont be disappointed with the Marcy Diamond Elite Smith Machine, it's #1 in our top 10 list of top rated home gym's as the best smith machine available. You can't go wrong with the Marcy Diamond Elite MD-9010G. 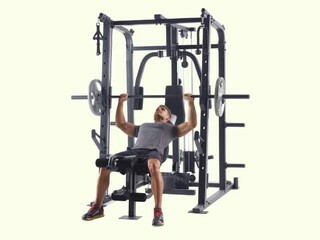 Why Buy An Affordable Smith Machine Like The Marcy SM-4008? The SoloStrength Ultimate : Best Functional Trainer For Home Use? 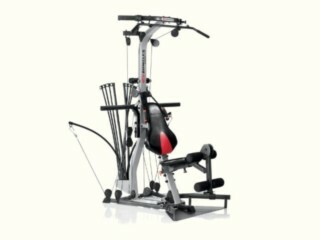 Bowflex Revolution Review: Most Innovative Gym For Home Use?